Luisa Maria Pastrana Martinez Sr.
Raffaele Marotta, Roberto Andreozzi, Ilaria Di Somma, Danilo Russo, Laura Clarizia Sr.
Multifunctional Photocatalytic Materials for Energy discusses recent developments in multifunctional photocatalytic materials, such as semiconductors, quantum dots, carbon nanotubes and graphene, with an emphasis on their novel properties and synthesis strategies and discussions of their fundamental principles and applicational achievements in energy fields, for example, hydrogen generation from water splitting, CO2 reduction to hydrocarbon fuels, degradation of organic pollutions and solar cells. 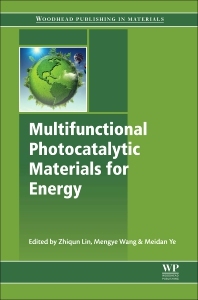 This book serves as a valuable reference book for researchers, but is also an instructive text for undergraduate and postgraduate students who want to learn about multifunctional photocatalytic materials to stimulate their interests in designing and creating advanced materials. Dr. Zhiqun Lin is currently Professor of Materials Science and Engineering at the Georgia Institute of Technology. He received his PhD degree in Polymer Science and Engineering from University of Massachusetts, Amherst in 2002. He did his postdoctoral research at University of Illinois at Urbana-Champaign. He joined the Department of Materials Science and Engineering at the Iowa State University as an Assistant Professor in 2004 and was promoted to Associate Professor in 2010. He moved to Georgia Institute of Technology in 2011, and become a Professor in 2014. His research interests include polymer-based nanocomposites, block copolymers, polymer blends, conjugated polymers, quantum dots (rods, tetrapods and wires), functional nanocrystals (metallic, magnetic, semiconducting, ferroelectric, multiferroic, upconversion and thermoelectric) of different architectures (plain, core/shell, hollow and Janus), solar cells (perovskite solar cells, organic-inorganic hybrid solar cells and dye sensitized solar cells), lithium ion batteries, hydrogen generation, hierarchically structured and assembled materials, and surface and interfacial properties. He has published more than 200 peer reviewed journal articles (with an h-index of 59), 10 book chapters, and 4 books. Currently, he serves as an Associate Editor for Journal of Materials Chemistry A, and an editorial advisory board member for Nanoscale. He is a recipient of Frank J. Padden Jr. Award in Polymer Physics from American Physical Society, an NSF Career Award, a 3 M Non-Tenured Faculty Award, and an invited participant at the National Academy of Engineering’s 2010 US Frontiers of Engineering Symposium. He became a Fellow of Royal Society of Chemistry in 2014 and a Japan Society for Promotion of Science (JSPS) Fellow in 2015. More information on his research can be found at http://nanofm.mse.gatech.edu/. Dr Mengye Wang is currently a postdoctoral fellow of Department of Applied Physics at The Hong Kong of Polytechnic University. She received her PhD degree in Physical Chemistry from Xiamen University, Xiamen, China in 2015. Her research interests include advanced materials for environmental and energy application, such as photocatalysis, electrocatalysis and solar cells. She serves as a Community Board Member for Materials Horizons. More information on her research can be found at https://scholar.google.com.hk/citations?user=uQx2EHIAAAAJ&hl=zh-CN.